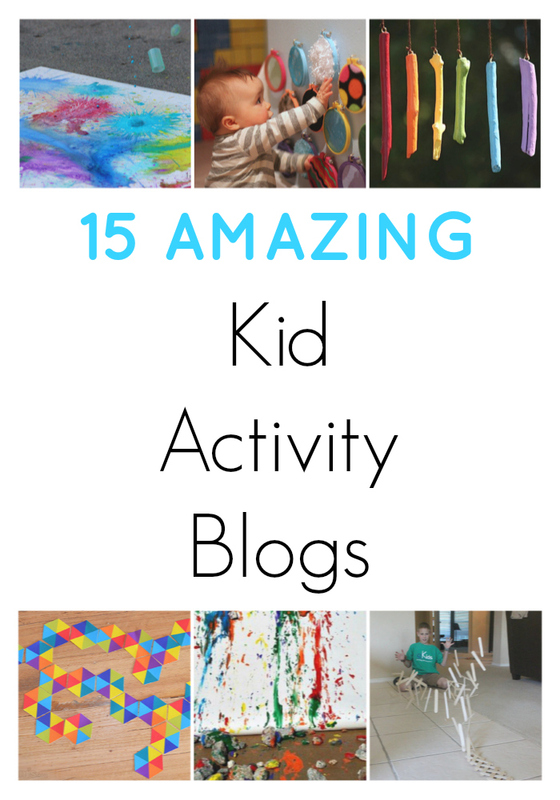 15 AMAZING Kid Activity Blogs! Hi, I'm Asia! On my blog, Fun at Home with Kids, you will find a little bit of everything - science, art, crafts, sensory play, and small world play. 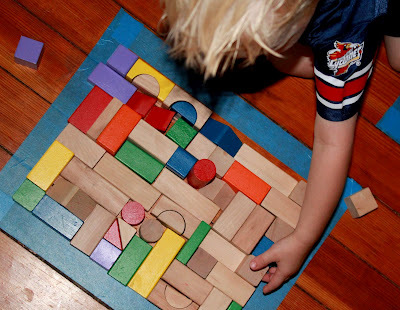 I try to focus on open-ended play that encourages creativity and imaginative play. My greatest hope is to make playing at home seem simple, easy, and affordable - because it can be! Hi, I'm Tammy! My blog, Housing A Forest, is packed full of fun and engaging activities for kids. I have a passion for encouraging kids to be creative and get excited about learning. On my blog you will find lots of fun tutorials that are easy to follow and are inexpensive to recreate. I hope that you enjoy creating alongside our family. One of my favorite posts is Exploding Art - an exciting combination of both art and science. 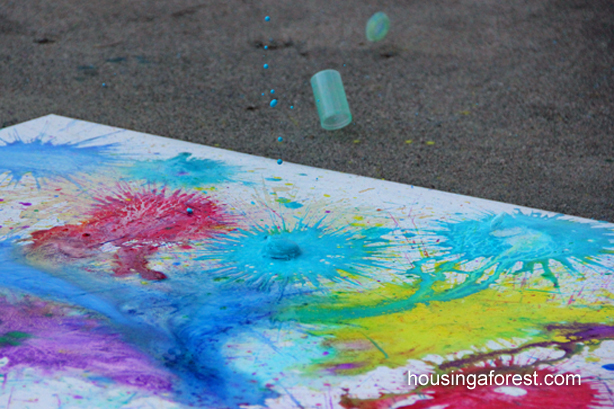 My kids were amazed each time their paint filled canister exploded into the air. The process was so fun and I love that it was an activity that we could all enjoy together as a family! 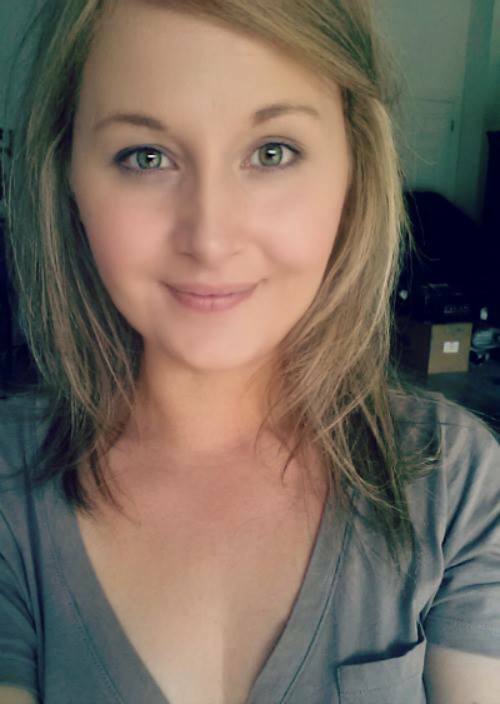 Hi, I'm Jen! Mama.Papa.Bubba. 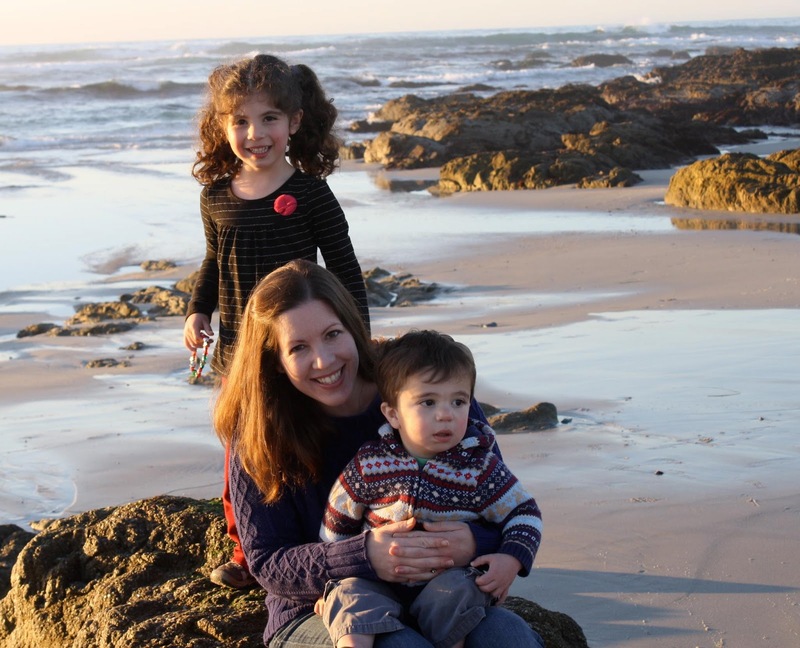 is about our adventures in engaged parenting, natural living, and overseas living and travel. 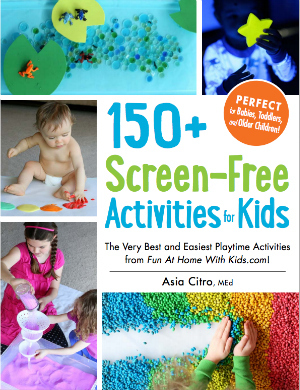 On it you will find fun crafts and play activities for little ones, healthful recipes, toddler food ideas, and doable DIY projects. 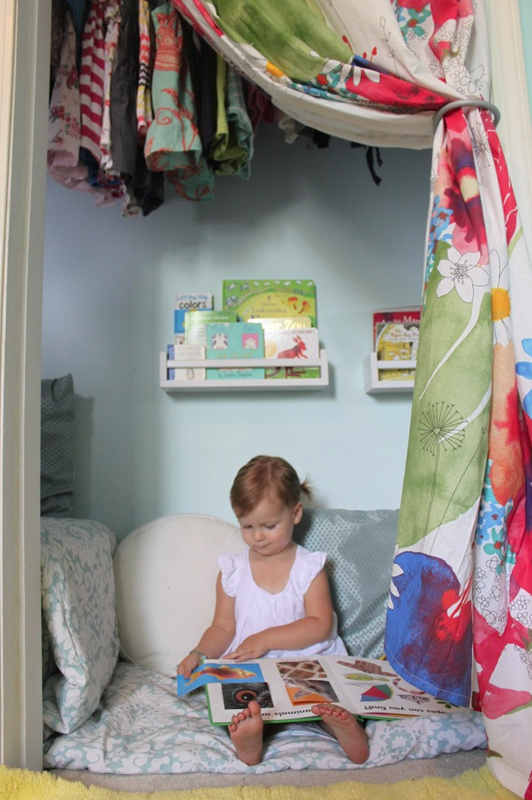 One of my favourite posts is about how I transformed my little one's closet into a cozy reading space while maintaining much of the closet's original purpose. Hi, I'm Jackie! On my blog, Happy Hooligans, you will find easy and affordable arts & crafts and good, old-fashioned play! In my home daycare, we’re all about using simple, everyday items and materials for one-of-a-kind crafts and unique activities. All of our projects and play ideas are suitable for toddlers and preschoolers, but the older kids will love ‘em too. C’mon over and join us for some fun! 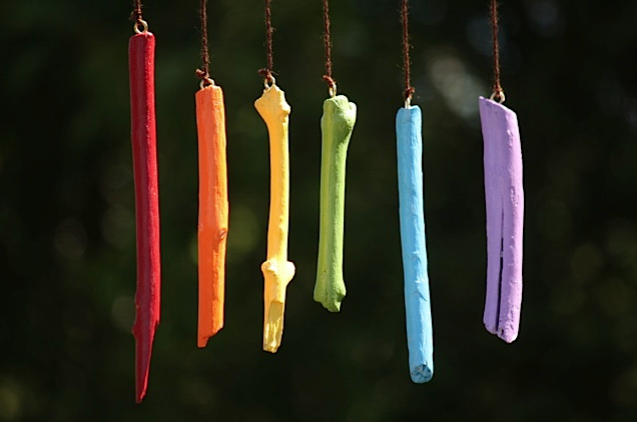 One of my favourite posts would be our Rainbow Wind Chimes. We sanded and painted sticks that we'd collected while on a nature walk, and we strung them from the low branch of a tree beside our sandbox and playhouse. They add such a fun burst of colour to our play space! Hi, I'm Cathy! On my blog, Nurturestore, you will find over 800 kids activities covering all types of play and learning for children aged 0 - 10. You can sign up to receive a free weekly Play Planner which gives you fun play ideas for every day of the week. 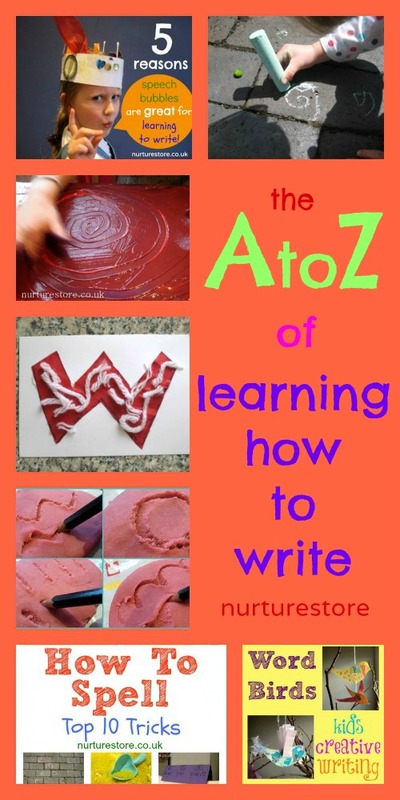 One of my favorite posts is my A-Z of How to Write, which is packed full of fun, creative, tried-and-tested ideas that you can use to help your children enjoy their first steps in learning how to read and write. Hi, I'm Shaunna! On my blog, Fantastic Fun and Learning, you will find a wide variety of fun learning activities and things to do with kids. We do a lot of theme-based learning through play for home preschool, and I love to share how we combine art, math, science, and reading ideas to go along with one theme. We also love sharing book ideas, small world play, and sensory activities. 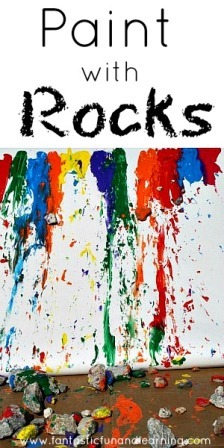 One of my favorite posts is Painting with Rocks, one of the posts in our R is for Rocks series. We used large rocks and paint to explore gravity and make a beautiful collaborative art piece. The kids loved the entire process, and we keep it hanging in our outdoor play space as one of the reminders of all the fun and learning we've done so far. Hi, I'm Jamie! Hands on : as we grow is all about kids activities, crafts and art projects for hands on moms, focusing on activities for toddlers and preschoolers. I made ‘being hands on’ a New Year’s Resolution and it’s all about my journey to being a hands on mom. Hi, I'm Chelsey! My motto, “Creating and Educating with Love” really sums up what Buggy and Buddy is all about- nurturing and fostering a love of learning in a positive way. My readers enjoy finding crafts and activities for children that foster creativity and learning while still having fun! I love activities that encourage learning and growth in more than one area. 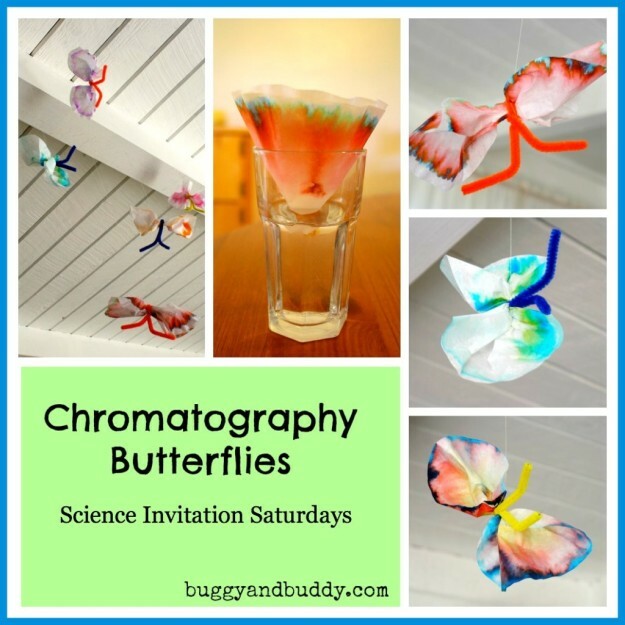 Our Chromatography Butterfly experiment was a fun way to learning about separating colors while creating an art project at the same time! 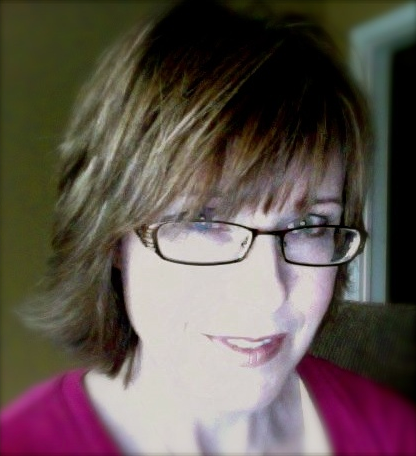 Hi, I'm Deb! On my blog, Learn with Play at Home, you will find activities and ideas for children with handy tips to help you get the most learning for your children. We love to get creative with a range of arts and crafts, you'll see plenty of hands-on, open-ended maths and literacy activities for the early years as well as some scientific explorations, cooking fun and more! There's plenty to keep your little ones entertained and learning and as an Early Years Teacher-on leave, I share my knowledge on ways to extend and simplify all activities to suit the individual needs of your child. After all, every child is different! One of my favourite posts is our Bottle Top Calculator. I loved the combination of recycled materials used in this creative activity to provide children with a fun template for learning more about numbers. It is still pulled out at our house all the time for pretend play. You can also find us playing on Facebook, Pinterest, Twitter, Instagram and Google +. Come and play too! Hi, I'm Stephanie! On my blog, Twodaloo, I post developmentally stimulating early childhood activities that I do with my twin toddlers. We focus on imaginative play, art, nature, and communication skills (I have a background in speech-language pathology) and we LOVE to get messy! 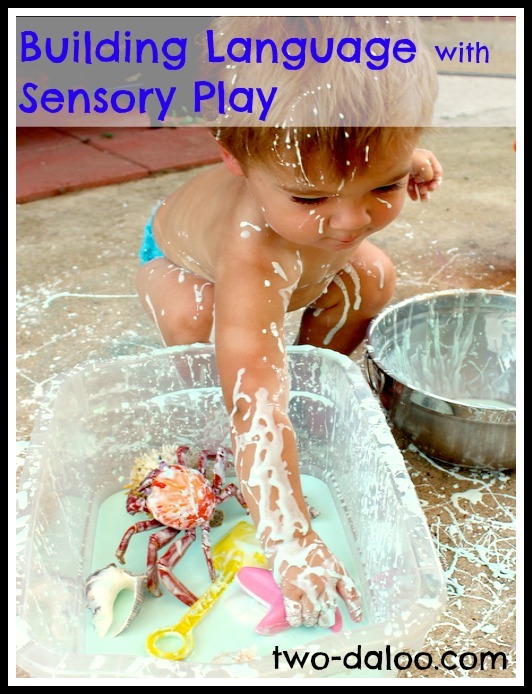 One of my favorite posts is Building Language with Sensory Play, a post from my new Playing with Language series, that shows how you can use all the fun sensory play ideas you see on Pinterest to stimulate language development in young children. Hi, I'm Jessie! On my blog, Play Create Explore, you will find a family living a low media life in the beauty of the woods of the Ozark Mountains. 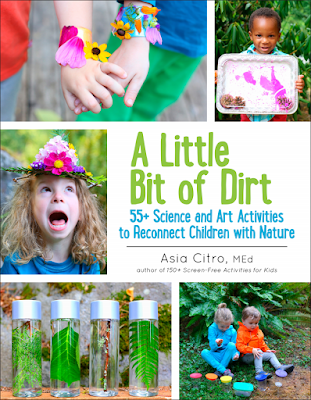 With a strong focus on outdoor and sensory play, you'll also find a wonderful mix of both new and bold, and classic and simple ideas and activities to give children a truly magical childhood--both indoors and out! 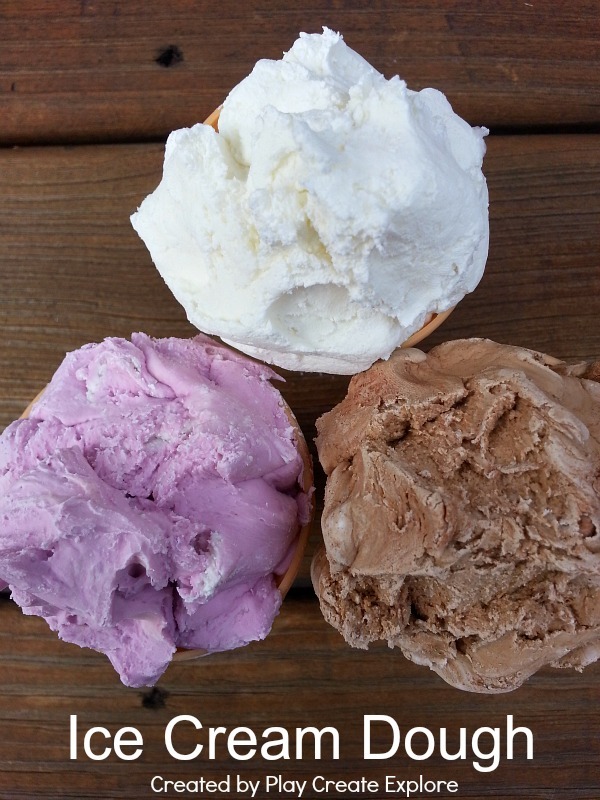 One of my favorite posts is our Ice Cream Dough, because it is a truly unique recipe for a fabulous new kind of “play dough” that in our kitchen, I developed myself! Hi, I'm Aleacia! On my blog, Dilly-Dali Art, you will find unique art projects for kids. We do a lot of process based art and love to get messy! We also create art inspired by other artists, books we read, and things we experience throughout the day! 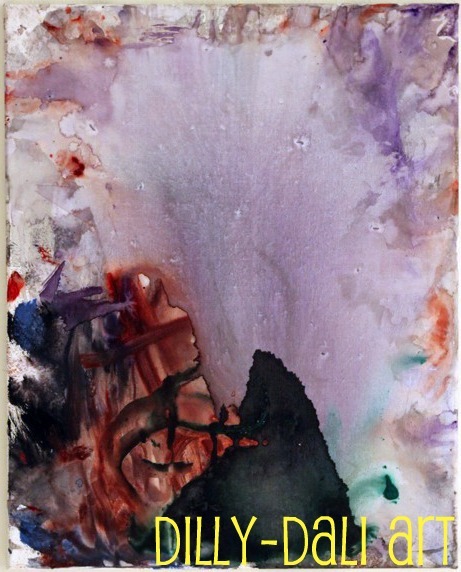 One of my favorite posts is the very first post from our "Inspired" series, working in the style of Helen Frankenthaler. Hi, I'm Kate! On my blog, Picklebums, you will find stories from a mum of four, muddling through raising a family on a small property in rural Australia. We share our struggles and triumphs with gentle parenting, gardening, feeding our family and all the fun, crazy activities we get up to. I really believe that doing activities with your kids doesn't need to be hard, or fancy, it's the simple, easy things that are always the best. One of my favourite posts is my post on our homemade Hexi-cards. I created this free printable on the spare of the moment one day and it has turned out to be one of our most love activities. 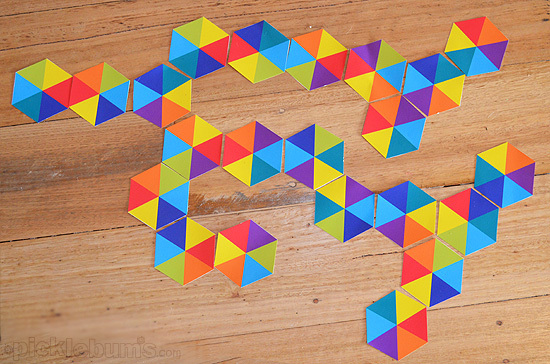 It's such a simple concept, just hexagons with different coloured wedges, but it inspires so many different ideas for play and learning for all my kids - from the toddler to the nine year olds. 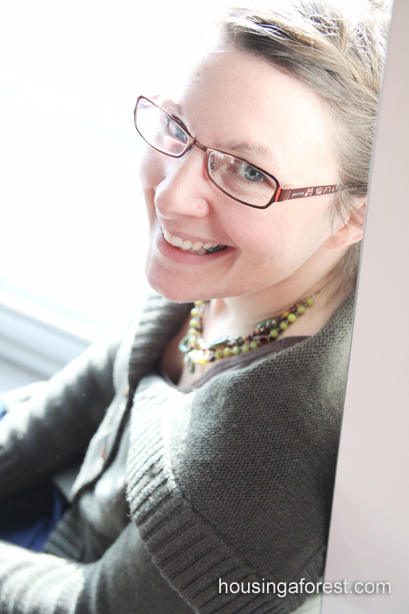 You can also find me on facebook, twitter, google plus and pinterest. 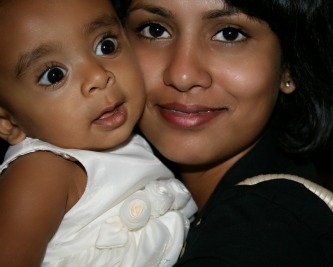 Hi, I'm Suja! On my blog, Blog Me Mom, you will find fun and easy kids activities for toddler through Preschool/Kindergarten age. We have simple art projects, frugal craft ideas, fun sensory play ideas, a few play-based learning ideas and many holiday crafts and activities. 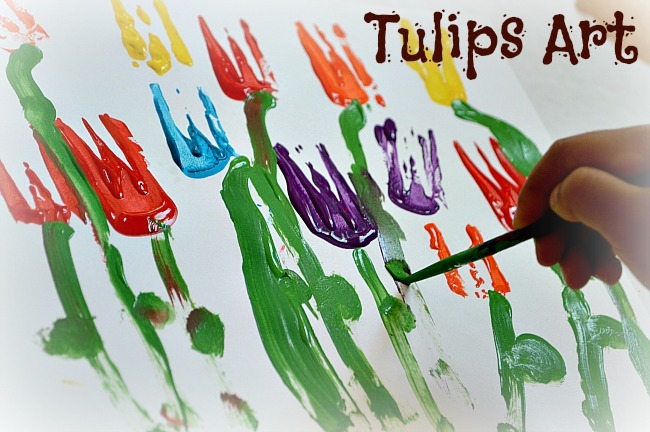 One of my favorite posts is also one of my popular posts - Tulips Art. It is my favorite simply because the tulip art project was not pre-planned (the first time around) and it evolved into a "tulip project" because of a casual comment made by the dad. My older kid especially enjoyed this activity because she though it was so hilarious to be making flowers with forks. It was a fun activity. Hi, I'm Sarah! I am a homeschooling mom of four boys sharing ideas for keeping boys busy on my blog, Frugal Fun for Boys! 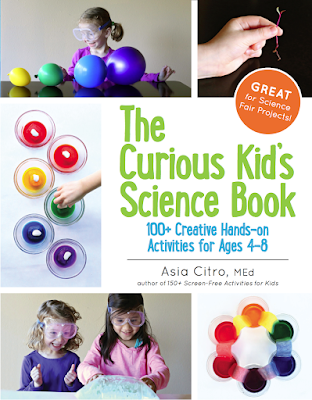 You'll find ideas for crafts that boys will like, ideas for active play, and ideas for educational activities as well. It's pretty boy-heavy at my house, but many of our ideas would appeal to girls just as much! 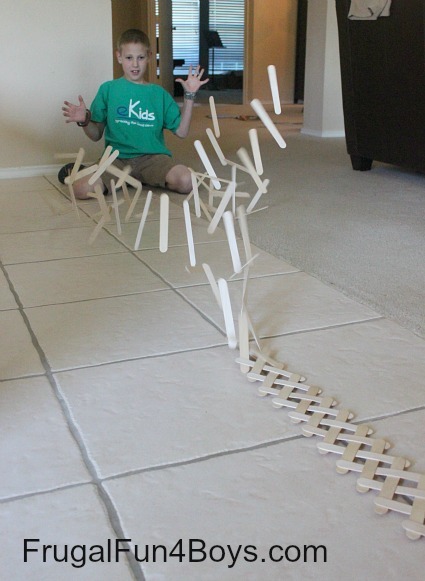 One of my favorite posts is our exploding chain reaction built from craft sticks. It takes a little bit of work to learn how to build one, but the result is awesome! To find even MORE amazing kid activity blogs, be sure to check out the comments! If you are a blogger or if one of your favorite blogs wasn't mentioned, please tell us about your blog/your favorite blog below!!! Thank you so much, Jessie! You are so kind! You have been such an inspiration to me (and others!) and I hope more people are able to find the AWESOME that is Play Create Explore!!!!!! This. Is. Amazing! Thank you for taking the time to put this together for us mom's...You all make playing at home sooo easy and fun!! Yay!!! I'm so glad you like it! Thank you for taking the time to leave me such a sweet comment and you are one of the most amazing mommies I know! I love seeing all the photos of those sweet babies of yours playing! So honored to be included in this group of fabulous bloggers! Thank you, Asia! 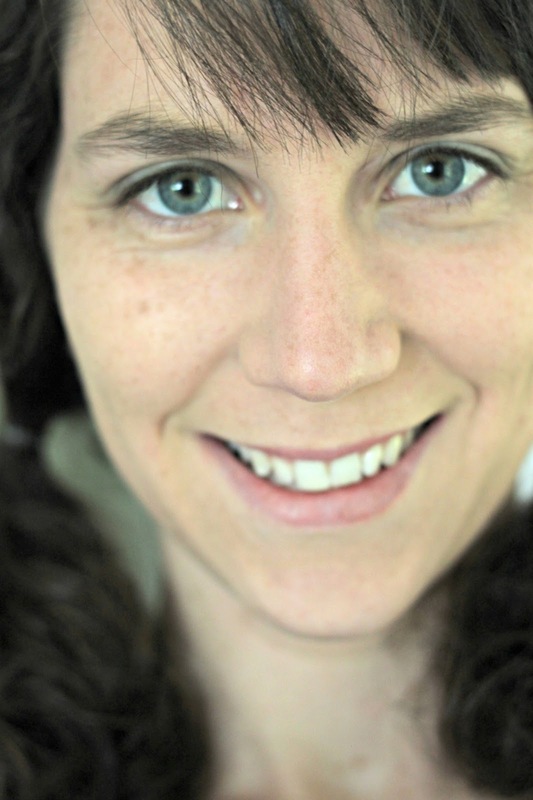 What a fabulous list of creative bloggers. They are some of my favorite "go-to" blogs, including yours:) Honored to be including among such creative ladies:) Thanks Asia. Aw, thanks Tammy! The list wouldn't be complete without you!!! Indeed, great job and great artworks here! Keep it p, congratulation for the good work for kids! Great group of bloggers! 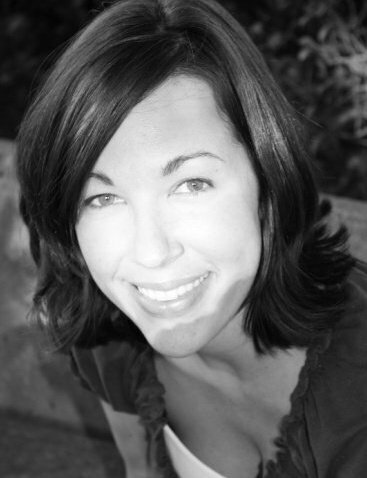 I had no idea so many kid-centered blogs existed, either, when I first started my blog. It's so cool to get all of the different styles/viewpoints/ideas from different moms. Thanks, Jeanette! I love your blog (www.artchoo.com), too! You have so many great ideas, I always find myself pinning away there. It's crazy how big this blogging world really is, right? How wonderful of you to highlight such great blogs! You can never have too many ideas coming into your email box! What an inspirational collection of blogs! Each one is impressive and unique in its own way. I'm very honored to be included! Thank you, Asia! Thank you, Shaunna! And so glad to include your amazing blog!!! Thank you so much, Jackie! It's such a great group! I only wish I could write a post on like 100 amazing bloggers (though there are probably even more than that!) - it was so hard to narrow down to just 15! This is a great list -- these are all blogs I've come to love this year! I also followed a few blogs before I started blogging, but I had no idea how many AMAZING kid blogs there were. I get warm and fuzzy thinking about how much all my new friends are doing for kids by sharing ideas. Hi Jessica! So true - there are so many out there - including yours! I LOVE Play Trains!!!!!!! As someone else already mentioned, you guys make playing at home seem so easy! What a great list of blogs. 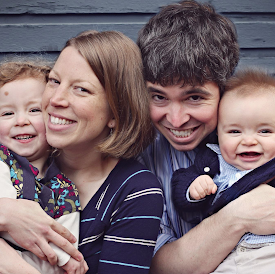 The people you featured are some of my favorite blogging role models! Sam from Thrive360. 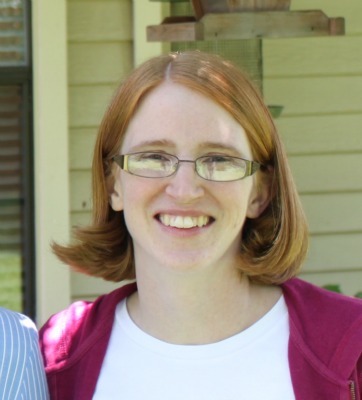 Sam hasn't been blogging long, but you'd never know it from her blog. Whoa...it's so professional! I imagine she's most famous for her painted rock activities, but her whole blog is so cool. And I'm glad jessica (play-trains.com) commented. I was going to mention her. 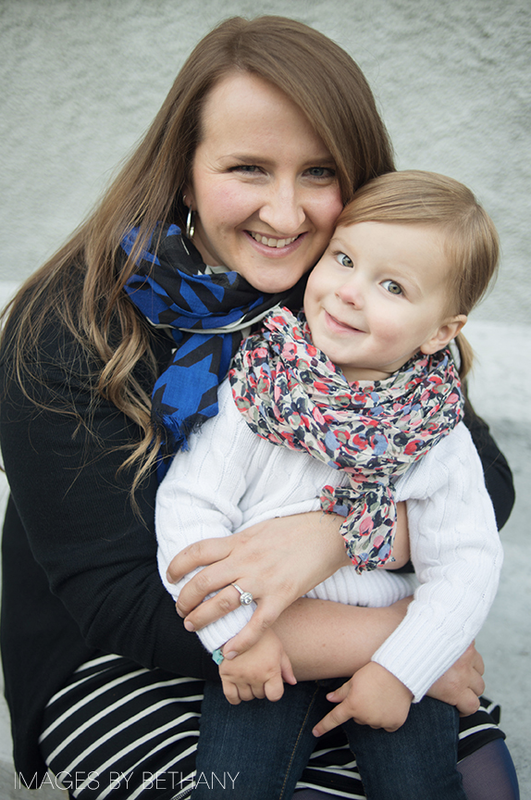 I've sent her blog to soooo many of my friends with train-obsessed kiddos! Then there's Rainy Day Mum, Creative Playhouse, Stir the Wonder, MamaSmiles, House of Burke....wow, how did you ever narrow your list down? Congrats on 100 posts! It's been amazing to watch you grow and succeed these past few months! Hi Rachael! I love all of the travel tips on your blog! Thank you for your sweet comment! It was INCREDIBLY hard to narrow it down, because, as you mention, there are so many of you who have amazing blogs! I totally agree with all the blogs you list! I follow along with you, My Nearest and Dearest, Fun-a-Day, Thrive360 (www.thrive360living.com), Fireflies and Mudpies, and Play Trains! I also love and read the others you mentioned as well! 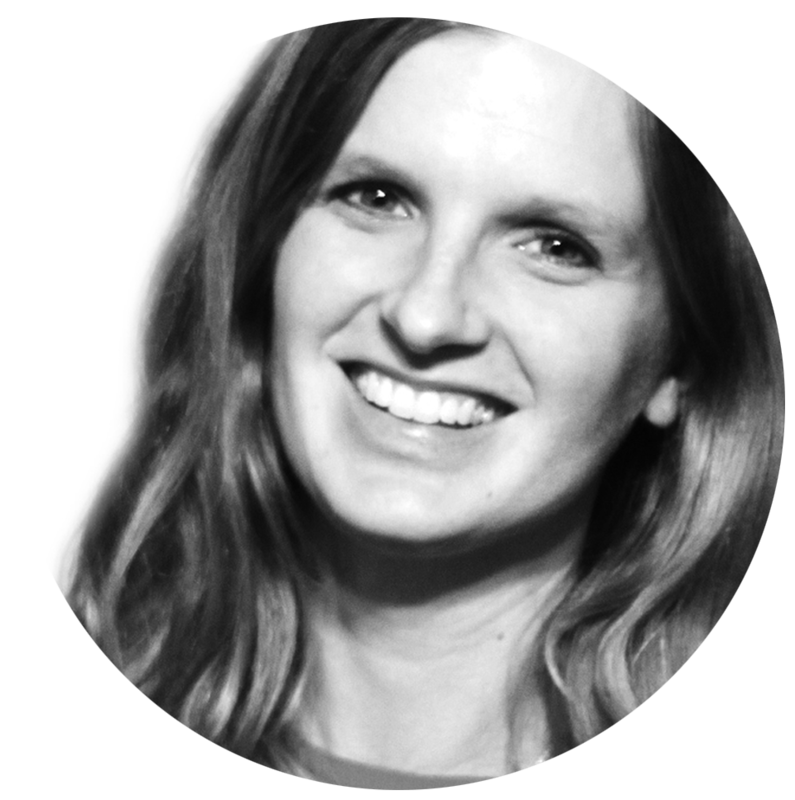 There really are so many great ideas out there - thank you so much for taking the time to add those great blogs to this list!!!! So many great bloggers... there are just so many people to be inspired by! Thanks for the great round up! These are some of my fave blogs too! What can I say, I'm partial to art! Thanks for the inspiration! I only knew like half of these blogs. 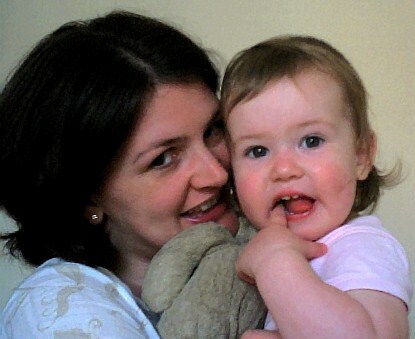 I'm having an English/Dutch blog for the activities I do with my 3 small kids. In terms of inspiration krokotak is also quite amazing. Hi Kim! Thank you so much - and awesome! Hmmm, that's weird! I just went through and clicked on (nearly) everything and it all worked on my end? I'll check again later. Maybe it was just being glitchy? I agree! Love all of those! Bookmarked! Have to visit these great blogs :) Thanks for sharing. I went through all your posts and those were amazing! Awesome job! Super Blogs. Thanks for sharing. Thank you so much. Nice to see some parents and their stories. What they do is fantastic.